Eagle-eyed motorists were in for a surprise when pranksters tampered with a petrol station price sign. The 24-hour Tesco garage in Fleetsbridge, Poole, Dorset, was targeted on Sunday morning. The unleaded petrol price was changed to 25.9 pence per litre and the letters LOL - which normally stand for Laugh Out Loud - were written below it. The normal price of unleaded petrol at the station is 125.9 pence per litre. Tesco said it had corrected the sign. A spokesman said: "Staff corrected the sign as soon as they were alerted to the prank." The spokesman said it was spotted on Sunday morning and no permanent damage had been caused. 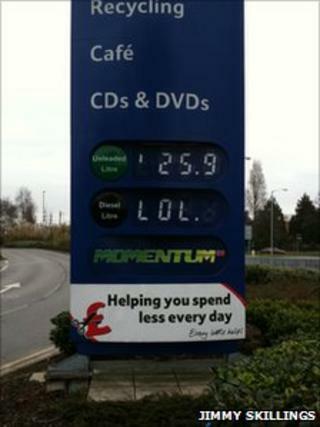 Jimmy Skillings, who spotted the prank and took a photograph, said: "I know petrol prices are a joke but this is funny. "Whoever did it sure has a sense of humour."